Admittedly, there's really no such thing as a completely homegrown Japanese tabletop game. But Japan has had centuries—and often more than a millennium—to put its own spin on imports from other countries. Check out our top picks to play on a rainy day! Just like President, there are several house rules that have developed over time, but here are some of the core rules: All the cards are dealt out evenly to everyone, after which the daifugo, or Grand Millionaire, gives his or her worst two cards to the daihinmin, or Grand Pauper. Meanwhile, the daihinmin must give his or her two best cards to the daifugo. After dealing, the game is generally played in clockwise rotation. Any players who aren't in the top or bottom two become hemin, or sometimes additional ranks are added if there are many players. In some versions, the players change seats as their rankings change, with each person sitting in descending rank to the left, though this typically doesn't occur in Western adaptations. For the first round, everyone is a heimin, or Commoner. This is a trick-taking game, but the goal is to get rid of your cards as quickly as possible. The first person to get rid of his or her cards becomes the daifugo for the next round, the second becomes the fugo, etc., until finally the daihinmin emerges. The daihinmin then gathers all the cards, shuffles and deals for the next round. Despite resembling a single-player memory game you'll find on some computers, mahjong is actually a tile-based game that's structurally similar to the card game rummy. The goal is to create sets by drawing and discarding tiles, with the ultimate objective of getting all 14 of your tiles matched into sets. 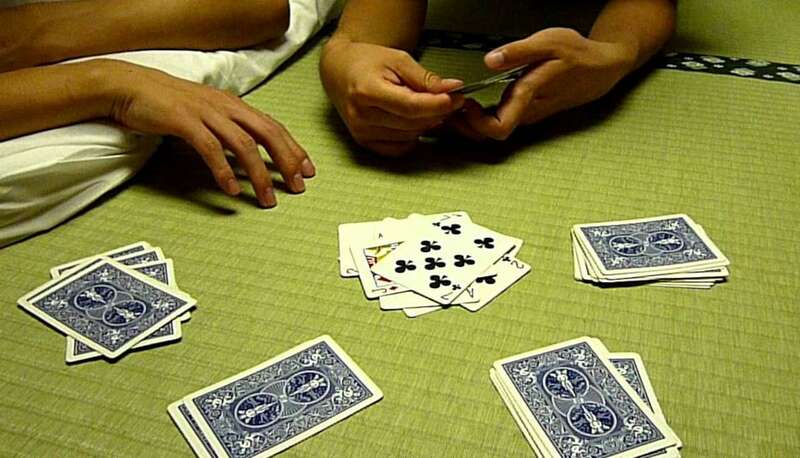 The sets could be a matching three, matching four, or a sequential run of three, with a standard winning hand composed of four sets and a single pair—though there are also a few special winning hands that stand as exceptions. The Japanese version, called Riichi Mahjong, or simply Japanese mahjong, is a slightly simplified version of Chinese mahjong, which was first introduced to Japan in 1924—though new rules have since been added to increase the complexity. The main differences are in the rules for declaring riichi, or a ready hand, and bonus dora tiles that can add value to your hand. It gets rather complicated once you start getting into the values of the different hands, but for a full run-down, check the rules below. Sugoroku is the classic dice-based board game. The kanji for sugoroku are 双六 or 雙六, both meaning "two sixes," the highest value you can roll on a pair of standard dice. The original version of sugoroku, called ban-sugoroku, dates back to at least the seventh century. It was introduced through China, which itself found the game via the Silk Road. Ban-sugoroku was played almost identically to modern backgammon, with some rule differences. However, it faded from use in the early 19th century, and modern players simply play standard backgammon instead. Another form of sugoroku was e-sugoroku, with players moving their pieces around an illustrated map or board much like Snakes and Ladders. Dating to the 15th century, the earliest known version featured Buddhist teachings on each space (technically known as Jodo Sugoroku), but by the Edo Period (1603-1868), the most popular versions featured the 53 Stations of the Tokaido, the stopping points on the road connecting Tokyo and Kyoto, a popular subject for artists of the day. E-sugoroku boards were the ultimate in portability, typically illustrated on a piece of paper that could be folded up and carried around. They were played in a spiral pattern, and the winner was the first to reach the center of the board, while each game space might have special rules or additional instructions to add spice to the game. Similar to chess, this two-player board game involves strategy, patience and cunning. There are 20 pieces per player, with different abilities and rules for each piece. There are two important distinctions between shogi and chess, however. First, pieces can be promoted once they reach the back third of the board; and second, captured pieces can be returned to the board on your opponent's side. Promoted pieces are flipped over, revealing a new character that's typically written in a more cursive form, or in red ink. Unlike in chess, where only the pawn can be promoted upon reaching the back row, any piece except the king and gold general can be promoted in shogi. This gives the piece extra movement abilities, instead of changing out the piece. Players also have the option not to promote a piece so long as it has legal moves remaining, since the non-promoted form may have strategic advantages depending on the situation. "Drops," on the other hand, allow a player to take a captured piece and make it switch sides. However, a player may not drop and capture in the same turn, and any dropped piece joins the board unpromoted. The goal, as in chess, is to claim your opponent's king. Since all the pieces usually remain in play in one way or another, it is very rare for a shogi game to end in a draw. Shogi is believed to be based on Indian chaturnaga, which likely came to Japan via China, though exactly when is unknown. The earliest suspected date is the sixth century, though the first known pieces and documentation for the game date to the 11th century. Shogi underwent a number of variations—some versions using massive boards and up to 130 pieces, including one known as the "drunken elephant"—before becoming what it is today. Karuta is a card-slapping game that usually uses a special set of cards, although a regular deck can also be used. One set of cards (called tori-fuda) is laid out in an array, face-up, while a corresponding set (yomi-fuda) is kept aside in the care of the "reciter" or "reader." The reader draws a card from the yomi-fuda and reads it out, while the other players seek out the matching card in the array and try to slap it before their opponents do. Some famous karuta cards have the first part of a proverb or poem on them, with the matching card being the completion of the poem. The most famous of these is Hyakunin Isshu, which is traditionally played on New Year's Day. Iroha Karuta cards, on the other hand, are used to teach basic Japanese reading skills. The word karuta comes from the Portuguese for playing cards, or carta, since the Portuguese introduced them to Japan in the 16th century. However, it's believed that versions of this game were played by matching halves of shells as far back as the Heian Period (794-1185). Go is generally considered the world's oldest board game, having been invented in China likely in the second millennium B.C. It arrived in Japan in the seventh century, and was even mentioned in Murasaki Shikibu's The Tale of Genji, written in the early 11th century. 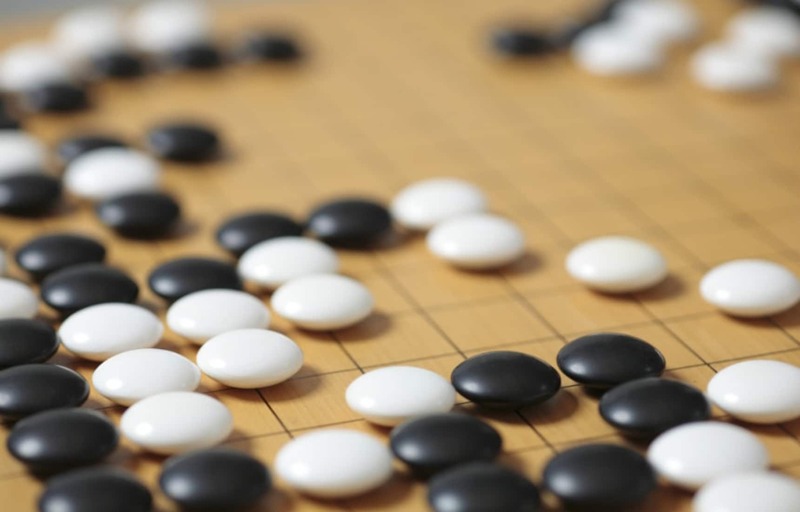 Go (sometimes igo) looks similar to Reversi, or Mattell's Othello™, but is vastly more complex. Indeed, it's supposedly so strategically layered that developing a computer that could successfully defeat a top-ranked human player became a benchmark for artificial intelligence development. Players take turns placing their "stones" (go-ishi) onto the board where the lines intersect. However, a player can also capture his or her opponent's stones by surrounding them. There are more intricate rules as well, such as the ko rule, which prohibits repetitive game play. Go requires a balance of several different internal tensions, with players needing to both expand their territory but also create solid, close-knit regions that their opponents cannot breach. While officially a variant of go, gomoku really just uses the pieces and some of the rules to create an entirely different experience. Gomoku is closer to Hasbro's Connect Four game. Instead of creating a line of four pieces, the players alternate placing their pieces on the board, trying to create a line of five pieces. Unlike go, the pieces do not move once they're played. Gomoku is short for the proper Japanese name gomoku-narabe, or "five pieces in a row." It's said to date back to the Heian Period (794-1185). Whatever your fancy, these classic games should give you plenty to do on a rainy day!